Treat yourself to this collection of hundreds of quick tales, each complete and unique, within the length of a tweet. It’s available in paperback and ebook. 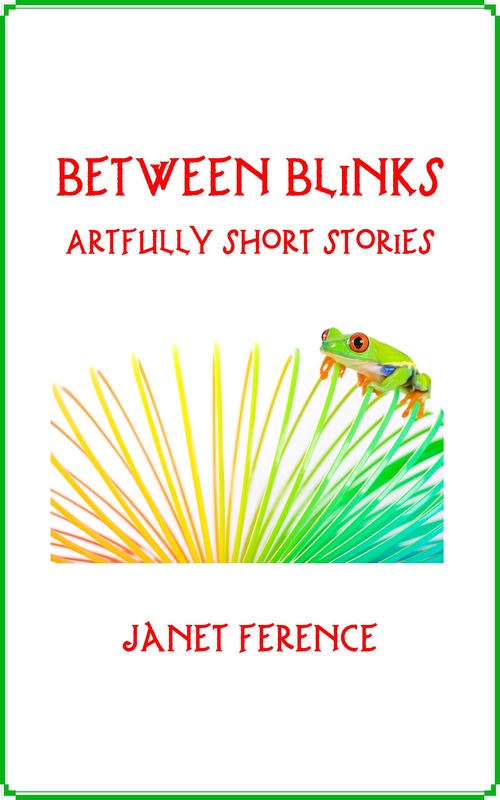 Click here to buy ‘Between Blinks’ on Amazon. Lara often dreams she’s swimming through air like a dolphin gliding in water. She’s playful, sleek and well-loved. Waking nearly drowns her. Amanda had an old oak cut down. The doves protested. She put up a feeder. It brought rats. She put out poison. That’s what killed the cat. He’s a stroke of mixed-hue blues. She’s a brush of bright pinks. Where they join, one with the other, they’re a streak of mercurial violet. Copyright ©2018 Janet Ference. All rights reserved.